Why is the City allowing major development when water supply is low? Won’t a building moratorium help save water? I’m working hard to conserve, will new development have to conserve as well? Why not stop building for a while during drought conditions just to be prudent then start up again when the drought is over? What if this drought continues for the next 5 years? What can we do to become a drought proof community? Developing permanent water efficient habits will make the most significant impact. Continuing strategies include placing more emphasis on water storage opportunities, use of graywater for landscape applications, and importantly, investing in water reclamation for long term sustainability. What plants can I use in my water-efficient landscape? I don’t like the desert look - what are my options? Once established, water efficient landscaping can be much more than rocks and cactus. There are hundreds of plants that need little, if any, irrigation. With proper design and plant selection, an applicant can accomplish almost any look or feel and still save water. See the previous question for websites that provide information on drought tolerant and native plants indigenous to our area. What is mulch and why is it helpful? The most common types of mulch are decorative rock, bark or wood. Mulch helps maintain the moisture level. Wood and bark mulches help retain the temperature of the soil. Without mulch, wind and heat pull the moisture out of the soil and more water is then needed to keep plants healthy. Also, the temperature of the soil constantly fluctuates causing stress to plants. Additional benefits include the reduction of weed growth, erosion and certain insect diseases. A minimum of 2-3” layer of mulch is recommended. Should I use a weed barrier? Weed barriers are generally recommended in areas that have a particular weed problem (i.e. areas where Bermuda grass is being removed or under permeable surfaces such as patios and walkways where plants will not be grown). If a weed barrier is used, the City requires that it be permeable allowing both water and air to penetrate. Does my drip irrigation system require a filter and pressure regulator? Yes. The emitters on a drip irrigation system have very small openings for the water to pass through. A filter prevents sediment from clogging emitters, ensuring that plants will get the correct amount of water. A pressure regulator keeps the irrigation system at the manufacturer’s recommended pressure (usually between 20 and 40 pounds per square inch). Not installing a pressure regulator may cause fittings and lines to fail, creating wasteful breaks and leaks in your system. What is considered to be an efficient irrigation system? The installation of an efficient irrigation system begins with good design. A low volume drip system is a proper choice for trees, plants and shrubs applying water directly to the roots. For turf areas, systems must apply water uniformly over the desired area with a minimum of overspray into adjacent areas. There are sprinkler heads on the market today that offer low precipitation rates (such as rotating spray heads) that save water and allow the soil to absorb the applied water minimizing any runoff. The City recommends installing a smart irrigation timer that (after proper programming) automatically adjusts itself to provide the right amount of water to your landscape. What is the application process for applying for a rebate with the City? 3.You will receive a phone call from the Engineering Department approving your application and scheduling a pre-installation inspection on site with a City representative. 4.Meet with City representative on site to confirm your existing materials or appliances to be replaced. 5.Once you have passed the pre-installation inspection you are free to make approved updates. 7.Once your post-installation inspection has passed and a valid receipt is approved, the City Representative will contact the City’s Finance Department to mail a check to the address on the application. Please allow 30 days from post-installation inspection to receive the rebate. Can I wash my vehicle in the City of Pimso Beach? Yes, you are able to wash your vehicle at your residence as long as the vehicle is attended at all times during the process, a hand-controlled water device is used, and there is no excess water runoff into the gutter. What qualifies me for the high-efficiency toilet rebate? Your current water bill must be in good standing, your current toilet must be 3.5 gallons per flush or more, your replacement toilet must be 1.28 gallons per flush or less and purchased in San Luis Obispo County. Please see terms and conditions for more details. What qualifies me for the cash for grass rebate? Your current water bill must be in good standing, you must have a 300sf or 500sf area or larger to be removed and replaced with drought tolerant landscaping depending on your lot size, your existing lawn must be living and maintained, Please see terms and conditions for more details. Am I allowed to irrigate my lawn at all hours of the day? No, currently the City has mandatory restrictions during the drought that mandates that irrigation is prohibited between the hours of 10:00am and 4:00pm. What days am I allowed to irrigate? During our severely restricted water supply restrictions Even-numbered addresses can irrigate on Mondays and Thursdays and Odd-numbers addresses can irrigate on Tuesdays and Fridays. Am I allowed to pressure wash my house, RV, sidewalk, or patio? Due to the current severely restricted water supply outdoor water use except irrigation is prohibited. The City will allow pressure washing if you are able to utilize reclaimed water or purchase water from a source outside of the City of Pismo Beach without causing excess gutter runoff. What will happen if I violate a water restriction? If a restriction is violated and seen by a City employee or reported by a citizen, a City staff member will give the property owner a courtesy phone call and warning letter for the first violation. Subsequent violations will incur fines; $100 for the second violation, $200 for the third violation, and $500 for each additional violation. Are there some easy things I can do to save water in a landscape? Check sprinkler irrigation systems regularly for physical and operational problems that reduce sprinkler system’s efficiency. Walk through an area while the irrigation system is running and repair or replace sprinklers that are broken, sunken, crooked, or clogged with soil or debris. Also, be certain that sprinklers are watering the plants they are intended to get to. When sprinklers are positioned incorrectly, they might be watering the sidewalk instead of your planting area. Make sure you’re not loosing water to the street and gutter. Correcting these problems can improve the uniformity of water application, reduce water waste by 10 percent or more, and greatly improve the health of plantings. What is the best approach for conserving water in a lawn or landscape? Ideally, you want to water infrequently and deeply. You can accomplish this by increasing irrigation runtimes and extending the number of days between irrigation events. This is contrary to the idea that you should reduce the irrigation runtime and keep the same frequent irrigation interval. To do this successfully, schedule slightly longer irrigation runtime so that the entire root zone of plants is rewetted at each irrigation site and gradually increase the interval between irrigations over a few weeks. This practice will allow you to save water while allowing your plants to adjust to a new watering regiment. 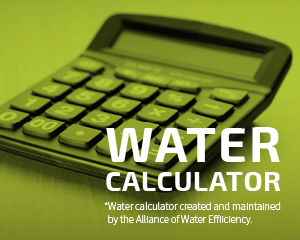 After extending the interval between irrigations, the water budgeting or seasonal adjust feature found on many controllers can be used to fine tune runtimes and achieve optimum water conservation. Remember that tall fescue lawns normally have roots 6 to 12 inches deep while roots of bermudagrass and other warm season grasses are normally at least 12 inches deep. The majority of roots of trees, shrubs, and groundcovers are normally found within 12 to 24 inches of the soil surface. In order to wet fully the soil to these depths without creating runoff or puddling of water will usually require scheduling two to four relatively short irrigation cycles of 5 to 15 minutes on each irrigation day, depending on slope, soil type, output of the irrigation system, and how much water is needed. Be certain the irrigation system is functioning well and applies water uniformly over the area. How much can irrigation be reduced without hurting trees, shrubs, and other landscape plants? Over irrigation is very common, so most plants can stand having their irrigation reduced by 20 to 40 percent. Gradual reductions applied over a few weeks using the approach described above is important so plants can adjust to less water, especially if the reduction is more than 10 percent. When is the best time of day to irrigate? Irrigating during the very early morning hours is best, generally between 2:00 A.M. and 6:00 A.M. Evaporation is lower and usually there is little or no wind to disrupt the pattern of sprinklers during these hours. In addition, water pressure is more favorable for irrigation systems in many areas during this period. Does a landscape have to be re-planted with specific drought tolerant or “California Friendly” plants to save significant amounts of water? No. Field research studies indicate that most established landscape trees, shrubs, and groundcovers, regardless of the species planted, perform acceptably with 20 to 40 percent less irrigation than they are typically given. These include many of the plant species commonly grown in existing landscapes. Established small shrub or groundcover are those that have been in the ground for a period of one year or more. A tree or larger shrub must be in the ground for at least three years to be considered established. What plants are actually drought resistant? A lot of commonly planted tree and shrub species are more water-conserving that you might think. All plants require a steady supply of moisture for one year or more after they are first planted. This is the plant’s establishment phase where it is developing an extensive root system. Once woody landscape plants are established, they typically perform acceptably with reduced summer water. Plant species that perform well in summer drought are typically species that evolved in regions with summer drought. Plants that originate from dry summer areas in inland California, Mexico, Arizona and Texas are adapted to limited summer water. Keep in mind that no native or ‘drought-resistant’ plant is actually water conserving until it has become established for a period of at least one year. If water becomes severely restricted, how should priorities be set to save landscape plants? When water is limited most people choose to water fruit trees, landscape trees, and shrubs. Lawns, groundcovers, and bedding plants can be reestablished over a relatively short time, but trees and shrubs need years to mature and are less easily replaced. A few deep, thorough irrigations spaced several weeks apart from spring through summer can be enough to keep most trees and shrubs alive when water is in short supply. Many tree and shrub species will drop leaves or wilt under severe water shortage but will survive. Under-watered fruit trees probably will produce less if any fruit, but will also survive. Once water shortages are lifted, these trees will again leaf out and produce fruit if applicable. When should trees, shrubs, and other landscape plants be planted in a dry year or if drought is expected? Hold off planting until fall or winter to take advantage of cool weather as well as fall and winter rains. How often should newly planted trees and shrubs be watered? The root balls of newly planted trees and shrubs need to be kept moist until a network of roots grows out into native soil. Newly planted container plants may need watering every day for several weeks during warm weather. Adding a 4 inch thick layer of mulch reduces water loss and weed problems. Delaying planting until the fall can reduce the frequency of irrigation required to maintain moisture in the root balls of new transplants and takes advantage of fall rains. Will adding polymers or similar “water conserving” products to soil really conserve water? Polymers and similar products by themselves do not conserve water. Adding a polymer to a soil can extend the length of time required between irrigations but will not alter significantly the amount of water used by plants. Field research studies with polymers to date are relatively few and inconclusive. Results suggest that although most polymers can extend the time between irrigations, some lose effectiveness when fertilizers and other natural salts are present in the soil. They will provide little benefit in soils with high clay or high organic matter content. When using a polymer product, add enough polymers to effectively amend the soil to the depth where most of the plants’ roots are and mix it evenly into the soil. A large volume of polymer will be required to increase significantly the soil’s water holding ability especially where relatively deep-rooted plants like trees and shrubs are grown. In most cases, it is cost prohibitive to incorporate this much polymer into the soil profile. The local water agency stated there is a Drought Watch in place. What does this mean and what can we expect? Nearly all areas of California are under a Drought Watch with some either in or about to enter a Drought Alert. When there is an impending or actual water shortage, local water suppliers adopt drought response plans that include measures intended to reduce water demand. The water use reductions and measures vary by the severity of shortage and are classified by stage. Stage 1 is known as a Drought Watch and usually asks for voluntary actions to reduce water use up to 10%. It relies on a public information campaign but can include enforcement of local water waste ordinances. Stage 2, a Drought Alert, mandates a 20% water use reduction and involves a more intensive public information campaign, enforcement of local water waste ordinances, and specific mandatory water use restrictions. Stage 3, a Critical Drought, requires up to 40% reduction in water use, and Stage 4, a Drought Emergency, requires more than 40% reduction in water use. Stages 3 and 4 often require site-specific water allocations and/or severe landscape irrigation restrictions. What are the easiest ways to reduce water use by a landscape without removing or damaging it? Be sure to water at night, ideally between 9:00 PM and 6:00 AM. Doing this reduces evaporation and the chance that wind will be strong enough to interfere with sprinkler patterns. Next, walk through the area while the irrigation system is running and watch how well the water is applied. Adjust sprinklers to get water completely covering the ground from one head to another and eliminate overspray onto pavement that leads to runoff. Repair any misaligned or broken sprinkler heads, fix leaks at heads or valves, and prune away any plant material that blocks sprinklers. Be sure to add mulch (4 inches preferable) around shrubs, trees, flowers, and newly planted plants to reduce evaporation. Finally, adjust the runtimes in your irrigation controller every month to account for changes in the average weather conditions. Doing all of these things can reduce landscape water use by up to 10%. How much water will be saved by upgrading to a “smart” or “ET” irrigation controller? Claims of 20 percent water savings are purported, but there is no guaranteed amount of water savings after installing one of the new smart or ET controllers. Few research studies have quantified the amount of water saved and simultaneously quantified performance of landscape plants after one of these devices was installed. Installing a smart controller can result in more, less, or the same amount of water applied to a given landscape depending on a number of factors. Critical factors include how much water was previously applied to the landscape (i.e. was the landscape over or under watered or watered correctly), how accurately the device was setup, and how well the irrigation system performs. A copy of an early UC Cooperative Extension study on these devices and links to studies by others are available at http://ucanr.org/landscapewater. How often and how much should non-turf landscape plants be watered? As a general rule, established non-turf landscape plants need less frequent irrigation than a lawn area. Many trees, shrubs, and groundcovers will perform acceptably when watered every four to ten days in the summer. However, this varies largely based on plant species. At each irrigation, enough water must be applied to fully wet most of the root system. In most cases, this means running the irrigation system long enough to wet the soil at least 12 inches deep. A good rule of thumb is to water your non-turf landscape plants infrequently but deeply. Your goal is to wet the entire root zone at each watering event and then allow the soil to dry before your next watering event. How can you determine how much water a sprinkler irrigation system applies? You can conduct a can test. Gather at least six straight-sided containers of the same size (used pet food or tuna cans work very well) and set them evenly spaced in the lawn placed between sprinkler heads. More containers often produce more accurate test results. Run the sprinkler system for 20 minutes and use a ruler to measure the depth of water (in inches) in each container. Total the water depths for all containers and divide by the number of containers to determine the average depth of water applied. Multiply the average depth by three to determine how many inches of water the system applies per hour. Use the results to set the runtime in your irrigation controller. While running the irrigation system for this test, note the time at which runoff begins. This is the maximum number of minutes the system should run for a cycle. In many instances, the irrigation system will need to run more minutes than the time to runoff in order to apply enough water. Scheduling multiple cycles separated by several minutes to an hour on an irrigation day will accomplish this without creating runoff and water waste. How can I tell how deeply the soil is wet after an irrigation? Take a long screwdriver, similarly shaped tool, or a special soil probe and probe the soil in several spots an hour or so after an irrigation. The depth that the screwdriver or tool can be easily pushed into the soil is the depth that the water has penetrated. If deeper wetting is needed to wet plant roots, then additional irrigation cycles are needed. It the soil is wet beyond plant roots, then irrigation runtime should be reduced. Checking the soil moisture each day with this technique and watching the plants for signs of wilt or water stress will enable you to see how long it takes for soil to dry to the point where water must be replaced. This is the maximum interval between irrigations for the current season. Ideally, irrigation is applied just prior to the onset of plant stress, so irrigation should be scheduled about one day shorter than the estimated maximum interval.